A few weeks later, a probate proceeding was prepared and filed in Santa Fe District Court on behalf of the personal representative by the prominent Santa Fe law firm (covertly) at the center of the TRUST violations. The judicial administration of an estate (probate) is an “equity” proceeding. This means that, in formally considering the end-of-life property and affairs of a decedent, county and state judges apply the dictates of conscience and the principles of natural justice to fairly determine the proper disposition of the decedent’s estate. Common law family trusts impose equitable duties on the trustee and grant equitable rights to the beneficiaries. The terms and conditions of such trusts are among the “equity” issues normally considered in probate proceedings in New Mexico. New Mexico statute law directs those participating in a probate proceeding - family members, attorneys and courts - to “discover and make effective the intent of” the decedent and directs that the terms of a related trust should generally “prevail” over other provisions of law. New Mexico Probate Code: §45-1-102. Rule of Construction; purposes of act. A. The Probate Code [of New Mexico] shall be liberally construed and applied to promote its underlying purposes and policies. (4) to facilitate use and enforcement of certain trusts. New Mexico Trust Code: §46A-105. Default and mandatory rules. A. Except as otherwise provided in the terms of the trust, the Trust Code [of New Mexico] governs the duties and powers of a trustee, relations among trustees and the rights and interests of a beneficiary. Since a written trust agreement is an excellent expression of a settlor’s intent regarding the “distribution his property” and since its terms are binding on all successor trustees and “prevail” over most other considerations, a key purpose of the probate proceeding in the Santa Fe TRUST Case would be to identify and correct existing violations of the family TRUST. 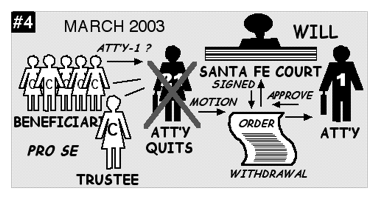 Litigation in subsequent court proceedings since 2003 has uncovered seven acts showing clear evidence of fraud, conspiracy, conflict-of-interest, attorney malpractice, deceit and/or collusion during the period covered by the Probate Case in Santa Fe District Court. Rather than acting to determine the meaning of the terms of the TRUST Agreement and to correct violations caused by property transfer, involved members and groups in the legal and healthcare communities in Santa Fe acted to suppress the TRUST Agreement, to cover up its violations, and to protect the professional orchestrators of the violations. These members and groups corruptly used their knowledge of trust and estate law along with their access to the district court to prevent discovery and correction of the TRUST violations during the probate proceeding. Many secret or covert details were kept secret and withheld from the successor trustee and beneficiaries. #2: Attorney-1 and Law-Firm-A Enter Into a Covert Conflicted Relationship: Notwithstanding the previous attorney-client relationship which had existed between Attorney-1/Law-Firm-A and the (1st) successor trustee, Attorney-1 and Law-Firm-A file a probate proceeding in Santa Fe District Court on behalf of the Nurse in her capacity as personal representative of the estate of the survivor/trustee. On its face this action sought judicial ratification of the property holdings of the Nurse as “fair” and “equitable,” an objective in direct conflict with the equitable interests of the beneficiaries and the equitable duties of the (2nd) successor trustee. Throughout the entire probate proceeding the conflict issue was never raised by any of a variety of knowledgeable Santa Fe professionals keeping the beneficiaries and trustee in the dark about the duties of Attorney-1 and Law-Firm-A to the (2nd) successor trustee. Attorney-1 denies the claim, and the Nurse retains Attorney-9 to defend her title to the property. A former (1992) attorney/employee of Law-Firm-A, Attorney-9 writes that the transfers were allowed by the terms of the TRUST and keeps quiet about underlying professional relationships and duties. In control of the estate and in possession of former TRUST property, the Nurse is now fully protected by cooperating legal representation both as personal representative of the surviving co-settlor’s estate AND as the owner of the property. 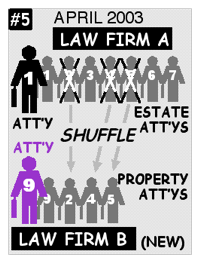 #5: Law Firm Shuffle Deepens Attorney Conflicts: Less than on month after the withdrawal of Attorney-21, three attorneys from Law-Firm-A including a “named” partner leave the firm to launch a brand new practice in partnership with Attorney-9. Notice of this “shuffle” of attorneys involved in the Probate Case is entered into the Court records through a notice of name change for Law-Firm-A where a new partner is inserted in the official firm name. The conflict-of-interest present in the Probate Case deepens because, in addition to Attorney-9 who was part of Law-Firm-A at the beginning of the TRUST Violation Period, the new firm representing the property interests of the Nurse now includes three attorneys (Attorney-2, Attorney-4 and Attorney-5) who were part of Law-Firm-A when the transfer of the Family Home was arranged for the (1st) successor trustee in 2000 and who are presumed to be privy to details of that violation. The new firm created in the middle of the Probate Case, Law-Firm-B, continues to represent the property interests of the Nurse against the property interests of the (2nd) successor trustee, a former client. Both the violation and the conflict are suppressed. 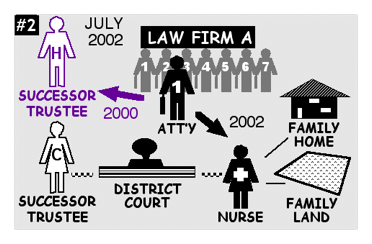 #6: Attorney-1 and Attorney-9 Collude in Threatening Beneficiaries: Now aligned in Law-Firm-A and Law-Firm-B, the estate attorneys (representing the estate interests and duties of the Nurse) and the property attorneys (representing the property interests of the Nurse concoct a scheme to escape their joint liability for TRUST violations and for conflicted practice. The estate attorneys through Attorney-1 prepare an estate accounting which as a result of large fees for the personal representative (the Nurse) and her counsel (Law-Firm-A) shows a five-figure dollar shortfall. 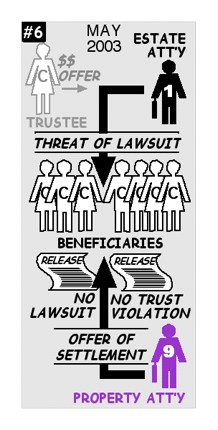 Ignoring the earlier attempts by the successor trustee to pay these estate fees as set forth in the TRUST instructions, Attorney-1 issues a written threat to all seven TRUST beneficiaries that each is going to be individually sued for the full amount of the shortfall even though four of the beneficiaries (of the TRUST) are not heirs (to the survivor’s estate). One week later, the property attorneys through attorney-9 send each TRUST beneficiary an offer of settlement with a proposed trade of releases: each beneficiary would be released from the threatened estate collection suit by the Nurse and the Nurse - and all the attorneys - would be released from any liability for violations of the TRUST. Each beneficiary was to encourage the others to settle because, unless all beneficiaries agreed, there would be no deal. The beneficiaries reject the offer and the Probate Case closes in July 2003 without the filing of any collection suit(s). #7: Equitable Terms of Trust Suppressed and Never Reviewed: The probate proceeding in the Santa Fe TRUST Case put the intent of the decedent clearly expressed in a signed and notarized family trust agreement against secret advice issued by a prominent Santa Fe law firm. In violation of New Mexico statutes §45-1-102(B)(2) and §46A-105(B) posted above, all of the legal professionals involved in the proceeding ignored and/or suppressed the family trust agreement and relied instead on the secret advice. What resulted was that the written expression of intent of the decedent was never considered in an important equity judgment of the district court. The equity beneficiaries of a valid New Mexico trust were denied fair treatment and - given, the above-documented sequence of (1) deceitful advice, (2) conflicted representation, (3) collusive defense of property, (4) forced withdrawal of the trust attorney, (5) reorganization of conflicted law firms and (6) collusive legal threats - the denial of fair treatment was the intended result of a corrupted year-long probate proceeding in Santa Fe. The New Mexico Probate Code was used to enrich legal and healthcare professionals. The intended beneficiaries of the trust were stripped of their legal defense and their property. Attorney-9 has served as a special master for the Santa Fe district court and is a state legislator with committee assignments related to judicial system funding and state healthcare appointments. In addition to an affiliation with with Law-Firm-A in 1992, that same year Attorney-9 served on the board of the healthcare group of the hospice nurse. Testimony in the Santa Fe TRUST Case has revealed personal interaction between Attorney-9 and the nurse in the 1990’s.